To the left of The Square today is a modern residence called ‘The Horseshoes’. The house stands slightly back from the original site of a 19th Century public house, “TheThree Horseshoes’, which stood on the corner of Crossing Lane and Billington Lane. It is believed this was run as a beer house under a licence for six days and ‘no spirits to be sold’. Pre-dating both the beer house and the neighbouring property which were built in the 19th century, was a Blacksmith’s Forge an essential part of village life at the time. 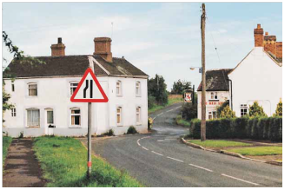 The building remained as a dwelling and a shop run by Alice and Clarence Lees, and on several occasions prior to it being demolished and the road widened in January 1991, vehicles travelling a little too quickly over the railway bridge ended up in Mrs Lees living room! The adjoining property has since been replaced by a modern family home, ‘Bridge House’. The Red Lion appears to have started life as two private dwelling houses. A John Bailey was probably the first owner. He left the building to his daughter Jane Cartwright, in 1779, where it was described in the will a ‘dwelling house with shop and garden’. In 1840 the building passed into the ownership of Thomas Newboult and, in this conveyance, it was described as a ‘dwelling house known as and going under the sign of The Red Lion and occupied by Abraham Heath’. The building has been a public house since that date, with the only major structural alteration being the flat roofed extension at the rear. Access can be gained via the car park to the very popular Greenway. 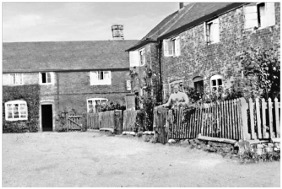 The cottages are of unknown dates, but were auctioned in 1827 as ‘two dwelling houses formerly one’, and were purchased by a Thomas Gripton for £310. These two have at some point become the three we see today. The dwelling nearest the Red Lion served for many years as the Village Post Office and today is the drop off point for village children alighting from the school bus. 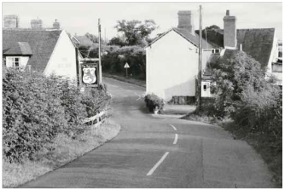 In the past there was no running water in the village; villagers collected their water from the village pump outside the Red Lion. In the 1800’s Derrington had a cobbler, reputed to have made shoes for the Royal family. There was also a blacksmith who owned the forge and the Three Horseshoes Public House – as they were next door to each other, this enabled the farmers to have a drink while waiting for their horses to be shod. The horse and cart was the first transport when villagers were taken to Stafford and back on market days for 3d (approx 1 ½p), with babies free. Until the advent of a school bus in 1945, children walked approximately three miles across fields to attend Seighford School, the school and houses being illuminated by candles or oil lamps until electricity arrived in 1928. In summer, the children made their own marbles, rolling clay into balls and baking them until hard enough to use. Many of the children were employed during harvest time, reflected by low attendances during this period.